Great view and updated! Sands Beach Club is a wonderful oceanfront property that has oceanfront or ocean view balconies; in this condo you can enter the balcony from both the spacious living area and master bedroom. This is an end unit providing extra light and views. Dining area for entertaining and fun game nights is sure to be a hit with all. Amenities include an indoor/outdoor pool and whirlpool, basketball and volleyball court, lighted tennis courts, covered parking area, elevators, and coin operated laundry facilities. "Unit was excellent and perfect for our needs. Great corner location." "This was our 2nd stay in this unit, and we were pleasantly surprised to find some updates from 2 years ago. The new living room furniture was very comfortable, as were the balcony chairs! Another nice surprise was having the beds completely made for us when we arrived (I had complained about this in my previous review), though our fitted sheet did not want to stay on our mattress. As for the negatives, I would still like to see secure internet access, instead of just the open Wi-Fi. Also continued to have problems with outlets that just quit working throughout the week. There was a leak either from the sink or dishwasher that left puddles on the floor. The sliding glass door to the balcony was off the track when we arrived, and even after fixing that problem, it would stick and was difficult to open. Description needs updated to state that they have a Keurig coffee maker. Luckily, the old coffee pot was under the sink, since I had brought regular ground coffee and filters. Regardless of the above issues, this is still my favorite place to stay in Myrtle Beach. I'll be back for a 3rd visit soon! "This was just a chance to get away for a few days with our 92 year old Mom. We have been staying at Sands Beach Club for years, we love the location because the beach is less crowded. We like to be up high enough to see the horizon and being on the end was a bonus. This was our favorite unit by far. Very well decorated. We will try to rent this unit from now on. We were a little bit uneasy about checking in because management was located off of the property, but it was so easy, could not have been any smoother. Just be aware, this unit did not provide additional trash bags, dish soap, etc. so bring what you need. Otherwise, the only problem we had was "our stay just wasn't long enough, we hated to leave"." "Fifteen year veteran of Sands Beach Club. Great location right on the beach. Loved unit. 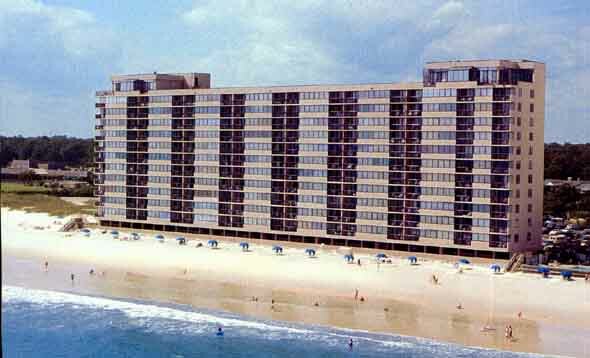 Myrtle Beach Vacation Rentals very easy and pleasant to work with. Only complaint would be pull out bed needs replaced, not suitable for adults. " "We had the perfect vacation. The condo was very clean and comfortable. The location was perfect and close to so many attractions. We loved waking up and going out on the balcony to such a beautiful view of the ocean. It was awesome and we can't wait to visit again next year!" "Excellent location, awesome condo with great furnishings and setup, and very friendly rental staff. " "I've stayed at Sands Beach Club several years in a row. While each unit was great, this was by far the best. Very clean, nicely decorated. I've noticed some updates to the buildings and property, Very pleased, See you next year. Can't beat that view! " "When we arrived at the condo it was obvious that it had not been cleaned. So I called the rental office & they sent some one up to clean it but the maid did not put the sheets on the bed. Also the television in the smaller room wouldn't work & that situation never got resolved after several attempts to contact the owners & the HOA. Overall the condo & location was great (light traffic) but the service was big disappointment." "Great unit and property for family vacation. " "Love, Love, Love...our room was awesome! Great view, big, well decorated, had all the amenities we needed. Would stay in this unit again!" "This is a great unit, in a great location. We chose this condo because we wanted to be at the end of Shore Dr., and the corner unit gives fantastic views. We found it to be decently equipped and very nicely decorated. Staff around the building, as well as those at were all friendly and helpful, as well. I was a little surprised that we were expected to make the beds upon arrival - for what we were charged for linens and cleaning, I would have thought that could have been done for us. Not a big deal, really, but I thought it was worth mentioning. We also had a few minor maintenance issues, the sliding door to the balcony was very hard to open and close, and several lamps' light bulbs were burnt out. The extra windows do give you more light during the day, but at night it is very dark, and there are no overhead lights, just lamps. Also, their Wi-Fi is the open Wi-Fi provided by Sands Beach Club. Hard to get a decent signal in our condo (the family we travelled with were 2 condos down, and definitely had a better signal). I would have appreciated a more secure and reliable Wi-Fi service. Finally, the kitchen is decently equipped with the basic pots, pans, and dishes, but beyond that, if there's something specific you're going to need, I recommend bringing with you. Bottom line, this is a great vacation spot for the money. We definitely plan on returning. " "Condo is very nice and in a great location. NO PHONE FOR EMERGENCIES! Must have cell that works in US. Otherwise condo is well furnished and clean. Lots of light as it is an end unit. Unfortunately we were not informed of the construction at the building with no pool and drilling/hammering starting at 8 AM every morning. Complained to MBVR and were told we should have asked when we booked. Not very helpful. "